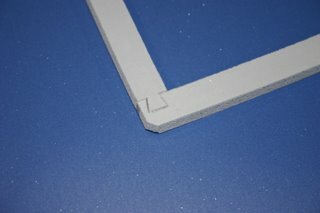 Stockwell Elastomerics offers UV corner bonding for large gaskets. This process includes die cutting or waterjet cutting the gasket “legs” with a dovetail type joint at the ends. The jointed ends are then bonded with a UV sensitive adhesive. The bonding is a manual process, so a cost analysis is required to determine whether the material savings exceeds the added labor of the bonding process. The material type, material thickness, overall size and order quantity are determining factors as to whether corner bonding is cost effective. The most common gaskets using UV corner bonding are large NEMA 4 gaskets used in telecom applications. These are large silicone gaskets with PSA backing (pressure sensitive adhesive backed gasket) used outdoors. Silicone offers excellent UV and ozone resistance and maintains its mechanical properties in very cold and hot conditions. The corner bond maintains a seal under hose down conditions where unbonded gaskets generally leak. It is important to understand enclosure design along with proper gasket material selection is paramount to successful NEMA enclosure seal. For more information regarding corner bonding or other custom gasket fabrication requirements, please call Stockwell Elastomerics at 215-335-3005 or complete a contact form for assistance.